What do these two lexicides have in common, aside from being wrong? They’re sailing terms. 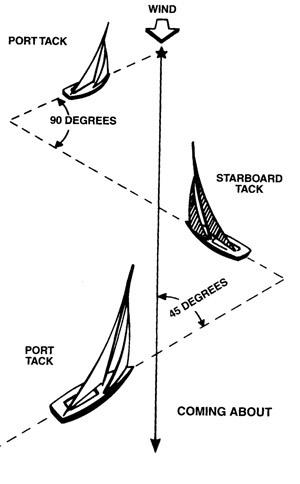 To jibe means to “swing a sail or boom across a following wind.” Tack refers to “a boat’s course relative to the direction of the wind.” So changing tack means moving the sail to change direction into the wind, and jibing – well, I’m not really sure how changing direction with the wind behind you translates into agreement or concord. Maybe it’s no surprise that jive supplants the term in the U.S. The Oxford American Dictionary defines jive as “a thing, especially talk, that is deceptive or worthless.” But come on, you don’t consult the OED for black colloquial, or jive talk – what you speak if you down with it. If you jive with what I’m saying, we’re two of the same mind. Solid. One other sailing term that’s crossed into the mainstream is gaffe. A gaff is a “a spar to which the head of a fore-and-aft sail is bent,” and also “a stick with a hook, or a barbed spear, for landing large fish.” Supposedly, the landing of large fish morphed into the making of large blunders, hence gaffe. I don’t know. Sounds fishy to me. This entry was posted in words on October 31, 2013 by mark.